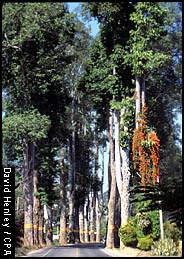 Just 30 km South of Chiang Mai, the provincial capital of Lamphun is a quiet town with a long history. From the 8th through the 13th centuries it was the capital of a principality called Haripunchai, which was originally rules over by the Mon Princess Chamadevi, subject of many legends. Lamphun today is a quiet town, but boasts several interesting sights and makes for an excellent day trip from Chiang Mai. The town is laid out in an oval and is bordered by tranquil moats and the river Kuang. Every August the town plays host to the Lam Yai festival, in honour of the fact that the lam yai fruit (longan) from the area are said to be the tastiest in the country. This temple, situated on what was formerly the site of Queen Chamadevi's palace, dates back to the 11th century, and is among Northern Thailand's most important temples. 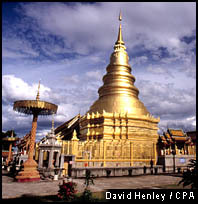 The compound is dominated by the central 46 metre high chedi topped with a solid gold nine-tiered parasol. In the grounds is a shrine containing Buddha footprints, and interesting murals line the walls. Also known as Wat Kukut, this temple contains two chedi in the Dvaravati style, almost the only such structures left in the country. The larger chedi, called the Suwan Chang Kot or Mahapol Chedi, is made of laterite and has five levels, with three Buddha figures on each side of each level. The stucco decoration around the Buddha images is particularly outstanding. The delightful village of Pasang, around 20 kilometers South of Lamphun, is renowned for its local cotton weaving industry. Also nearby is Wat Phra Phutthabaat Taak Phaa, a temple which features a Buddha footprint, and, according to local legend, the spot where Buddha once hung out his robes to dry.